Epoxy resin is a strong-hold adhesive used within many different industries. As one of the few adhesives which can withstand various heat and chemical applications, epoxy resin is a preferred choice for anyone looking to have a strong adhesive for their product, that won’t shift under pressure. Epoxy resin can be used on with many different materials, including: wood, metal, fabric/leather, glass or china. It has a durable and strong hold, but should not be used on objects submerged in water or facing UV light consistently. Using the epoxy resin in these environments causes the product to deteriorate and break down. What is Epoxy Resin made of? Scientifically speaking, epoxy resin can be made various ways, but stem from mixing a polymer with a reactive substance during the creation process. On a simplistic level, the resin is formed by mixing polymers and a class of reactive prepolymers. The final compound is a liquid solution that is a strong adhesive, with a significant hardening property when dry. This creates a highly durable substance that often can withstand chemical resistance and temperatures – making it an ideal substance for industrial, electronic and structural adhesive. Epoxy resin is also a popular choice for strong adhesives within the home and hobby industry as well. When dry, epoxy resin is known as epoxy; a diverse product that can adhere to most materials. Epoxy resin has a relatively long shelf-life – making it an ideal solution for occasional use. Is Epoxy Resin Safe for my Family and the Environment? Helping reduce overall emissions plays a key factor with most electrical, commercial and industrial product, making epoxy resins the ideal compound within an environmentally-conscious world. Epoxy resins are typically used in creating tooling applications like moulds, castings and fixtures – replacing wood or metal materials. Using the epoxy within the system allows for a longer repeated usage to the company and reduces the amount of energy needed to create many products (lowering energy and emission levels in the process). As epoxy is mixed with an agent at the time of use, protective gear must be used during its application. Epoxy resin is documented as an eye and skin irritant; however, using gloves and goggles will reduce any potential irritation. 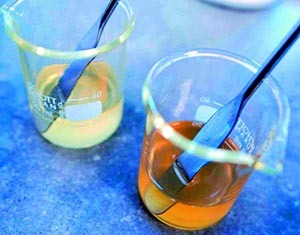 Epoxy resins are considered dangerous if ingested, as with most chemicals. What Can I Use Epoxy Resin For? Epoxy resin is typically used as a strong adhesive within the crafting and hobbyist industry. It is known as a high-performance adhesive, often referred to as “structural adhesives”. Used in construction of automobiles, snowboards, and crafting applications where high strength holds are needed. Epoxy resin is also used within the crafting industry to give a clear, glossy appearance, often used in jewellery, miniature building or items which need a wet or “water” appearance. Resin epoxies can vary in setting time, transparency and tint; depending on what final result is needed. As such, epoxy resin tends to work well for jewellery makers who enjoy crafting custom pieces with various finishes.